Source: Wikipedia, "Blazing Tornado", available under the CC-BY-SA License. 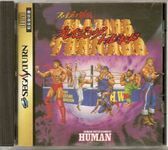 History Beginning with the first title in the series from Human Entertainment, Fire Pro Wrestling Combination Tag for PC Engine in 1989, the Fire Pro Wrestling series eventually produced editions of games for many systems, notably the Super Famicom, Sega Saturn, Game Boy Advance, Dreamcast and the PlayStation 2. Human also released a wrestling game outside the Fire Pro Wrestling series in 1989 for Game Boy. Titled Pro Wrestling in its native Japan, it was released internationally as HAL Wrestling. The series became popular in Japan, but did not see an international release until after Spike took over the franchise in 2000. Early games in the Fire Pro Wrestling series were popular outside of Japan with import gamers, and at least one game, Super Fire Pro Wrestling X Premium for Super Famicom, received an unofficial fan translation through video game console emulators. Fire Pro Wrestling A for the Game Boy Advance was released internationally as Fire Pro Wrestling in 2001, and was one of the titles initially available when the Game Boy Advance was launched in Japan and North America. Three editions of the game received official English translations: Fire Pro Wrestling (2001) and Fire Pro Wrestling 2 (2002) for the GBA, and Fire Pro Wrestling Returns for PS2 (2007). While other wrestling games made the transition to using 3-D polygonal models when 32-bit consoles arrived, Fire Pro Wrestling relies on 2-D sprites to represent the characters in the ring. Spike also has another wrestling game series in full 3-D, King of Colosseum.